In recent years, the creation of a diversified tourism infrastructure in Azerbaijan has increased the interest of foreign tourists in our country. Azerbaijan is among the fastest-growing destinations for tourists. 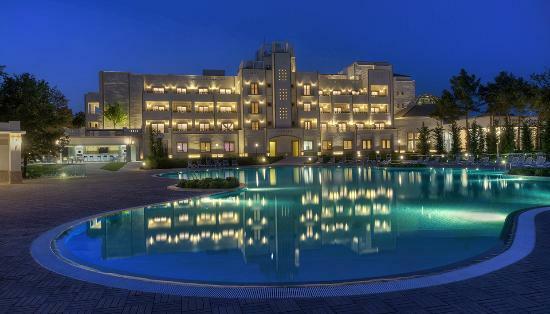 Last year, revenues of hotels in the country amounted to 359.4 million manats ($ 211.48 million). In 2018, local population and foreign guests have spent about 3 million nights in hotels throughout the country that is 15.9 percent more than in 2017, the State Statistical Committee told AZERTAC. As much as 59.1 percent of the hotel accommodations were observed in Baku, 10.4 percent in Gabala, 5.4 percent in Khachmaz, 4.1 percent in Naftalan, 3.8 percent in Guba, 3.6 percent in Gusar, 2.9 percent in Nakhchivan Autonomous Republic, Gakh and Ganja, 0.8 percent in Lankaran and 8.1 percent in other regions (cities). The number of nights spent by foreigners and stateless persons increased by 20.3 percent compared to the previous year and amounted to over 2 million, which is 68.3 percent of total accommodations. Of this amount, as many as 13.8 percent of foreigners came from the United Arab Emirates, 11.3 percent from the Russian Federation, 8.8 percent from Saudi Arabia, 4.9 percent from Iran, 4.3 percent from Turkey, 4.2 percent from India, 3.8 percent from Israel, Kuwait, 2.7 percent from Iraq, 2.6 percent from the UK and the U.S., 2.5 percent from Pakistan, 2.4 percent from Qatar, 1.6 percent from Kazakhstan, 1.3 percent from Oman, 1.2 percent from Germany, 1.1 percent from Ukraine, 1 percent from Bahrain and 26.8 percent accounts for the citizens of other countries. As much as 74.2 percent of foreigners stayed in Baku, 10 percent in Gabala, 3.7 percent in Naftalan, 3.2 percent in Gusar, 3.1 percent in the Nakhchivan Autonomous Republic, 3 percent in Guba, 2.8 percent in hotels of other regions and cities. The number of stays by the citizens of Azerbaijan increased by 7.5 percent compared to 2017 and reached 952,900 people. In 2018, the hotels' revenues increased by 26.3 percent or 359.4 million manats ($ 211.48 million) compared to the previous year, including 66.9 percent in services for the provision of rooms, 24 percent on foodstuffs sales, 3.3 percent - on treatment and health services, 5.8 percent - other services. Last year, the average national level of hotel accommodations was 21.4 percent (17.1 percent in 2017). This indicator was 54.8 percent in Naftalan, 37.3 percent in Gabala, 36.1 percent in Baku, 34.7 percent in Kurdamir, 32.7 percent in Agstafa, 30.4 percent in Shamkir, 26.3 percent in Beylagan and in other cities and regions lower than the country's indicator. The highest average level of hospitality use (37.5 percent) was recorded in August. In the modern world, tourism is one of the most dynamically developing and profitable sectors of the economy for each country. The tourism sector accounts for 10 percent of global GDP, and this area has a significant impact on issues of export, investment, infrastructure development and promotion of social integration, stimulates entrepreneurship.